An ambitious project to recreate the Starship Enterprise from Star Trek: The Next Generation has been forced to halt development following a cease-and-desist letter from broadcasting network CBS. 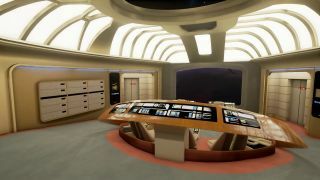 Stage-9 was built in Unreal, and as of its latest version, was a meticulous recreation of the Enterprise’s interior, matching both the layout and the interior style of the starship with impressive accuracy, and letting players eplore areas of the ship such as the Bridge, Main Eningeering, and Picard’s ready-room. Scragnog was always aware that the project existed at the mercy of the license holder. “Throughout all of this though, we knew it could end at any point.” That end came on the 12th of September when, Scragnong was issued with a cease-and desist letter from the CBS legal department. “Over the next 13 days we did everything we could to open up a dialogue with CBS,” Scragnog states. He points out that the team were happy to modify anything that “could be highlighted to us” that CBS were particularly unhappy with, to the point of altering the project to look at a different class of ship other than the Enterprise-D.
“We would have been happy to accommodate any and all of their requests for modification” he says. “Unfortunately, the answer was ‘no’”. It’s an unfortunate end to an interesting and genuinely well-meaning fan-project, and it’s sad to see CBS clamping down on something that had entirely benign intentions for reasons that the company seemingly still hasn’t disclosed. You can watch Scragnog’s full explanation behind the project’s end below.